At SankalpTaru, we integrate your creativity with technology to meet a social cause. For us, a job is much more than earning money and experience, rather serving Mother Nature at forefront. And certainly, our team is a true validation to this! Coming from varied cultural diversities, we are a bunch of dynamic enthusiasts proliferating greenery by the virtue of our service to environment. But with work, we never miss out having giggles and fun! So, if your earnest zeal to greenify the planet makes a perfect match with our vision, apply in a blink. Let’s have more green hands for the environment!! -Should have a flair for creative writing. -Would be responsible for designing and delivering PR and communication strategy for the organisation. -Create social media posts, reports, newsletter and case studies. -Should be self-driven and should have zeal to write on socio-environmental issues. We welcome volunteers from all walks of life to join our team as Green Champions. So, if you wish to give back to Mother Nature and Society, why not start your journey with us? Simar from our team has to say something! Hi, I am Simar Mann from Delhi NCR. I was earlier working with a MNC for 2 years and then a PSU for 3 years but there was something I knew I was not able to achieve. That feeling of satisfaction came to me only when I joined SankalpTaru. Serving the society, like a tree, selflessly with a team where everyone is like a family is beyond explanation. Now I feel that I am really living a life with purpose. 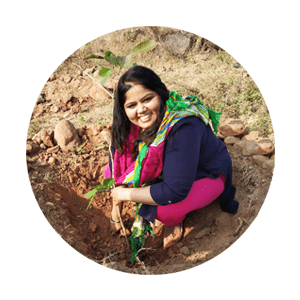 Engineer by profession, environmentalist by passion!